Do you have any pet photos that make you smile? As every pet parent knows, there is very little like the heartbreak of losing one of our dogs. Those of you who have been one of our readers for quite some time likely remember our first malamute – Reya. She was nicknamed ‘happy heart’ by our family and was my husband’s first dog. Her passing was extremely sudden and heartbreaking for our entire family, especially Ivi. While it was a trying time for all of us, there is one photo that my husband and I love so much of both Ivi and Reya together – the day we brought Ivi home. She was a very tiny puppy and Reya couldn’t wait to meet her new little sister. With how much we loved the picture, we thought it may be time to actually get it pictured and framed. 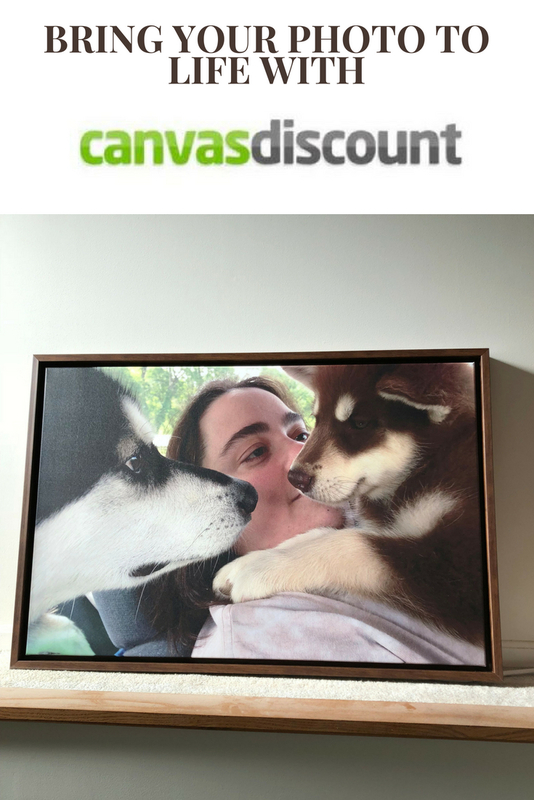 Luckily, we found the perfect way to memorialize one of our favorite photos – CanvasDiscount.com. 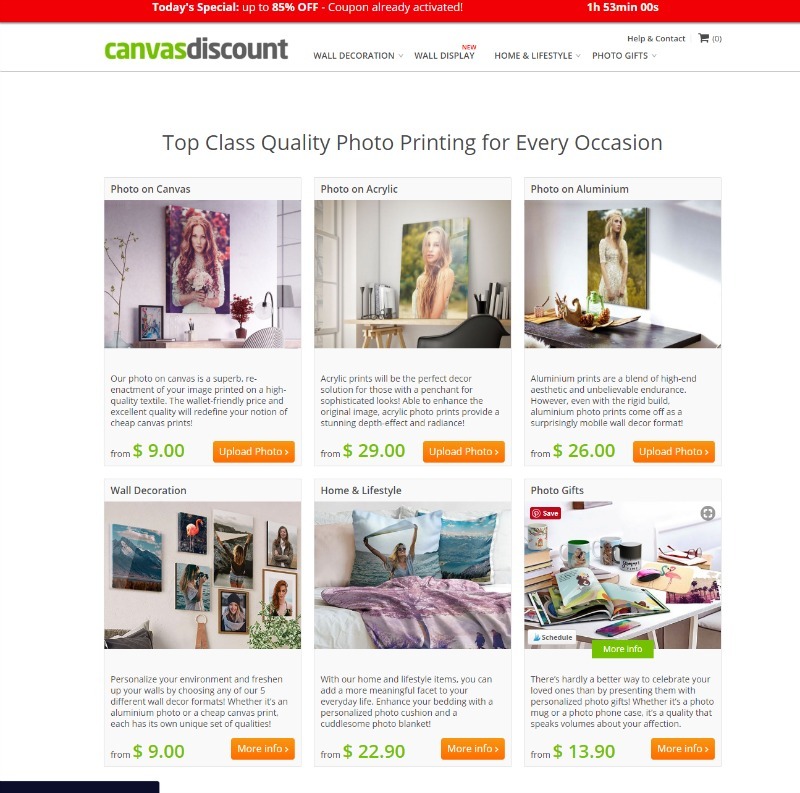 Why get a print from CanvasDiscount.com? They create high quality, photo canvas prints using some of the best quality material without a high price tag. Best of all, their top quality, family friend canvas prints are made right here in the United States. After you choose your print, it is then printed with solvent-free HP latex ink, creating a breathtaking image you are proud to display in your home. You can also expect your print to be ready within 24 hours for shipping, allowing you to get your new print quickly! They also do more than print photo canvas, since you can also get a blanket with your photo or other cool home and lifestyle items, making CanvasDiscount.com the perfect gift! 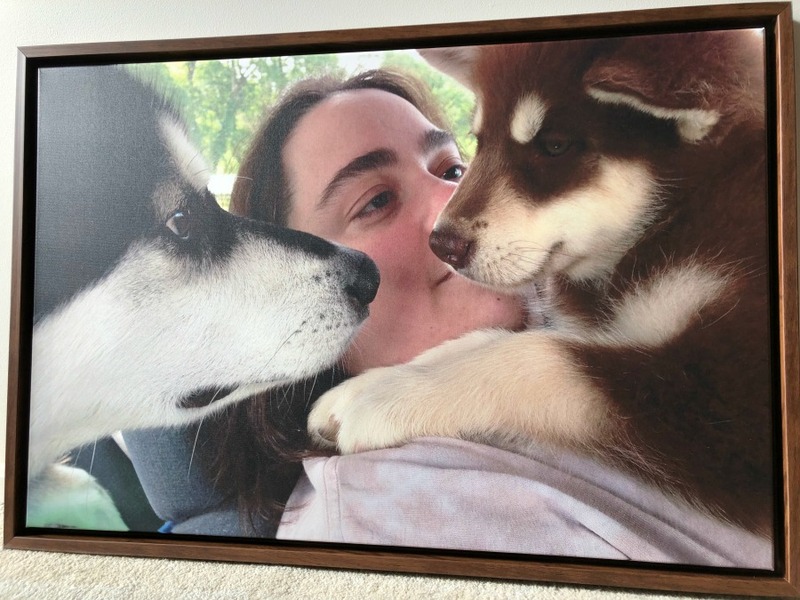 For our print of Reya and puppy Ivi, we decided to go with a 24” x 36” canvas print with a floating frame. After seeing some examples of a floating frame, we knew it would look absolutely perfect on our living room or entry way. Honestly, the whole process was much simpler than I thought. All you have to do is upload your picture, pick a frame, and you are ready to go! The hardest part was honestly picking the perfect frame, especially since I wanted something that matched quite a few of the other frames in our household. As the website promised, it also came very fast. From start to finish, the entire process was only four days, surprising me – I honestly wasn’t expecting it to be at my door THAT fast. As for the canvas itself, I couldn’t be more impressed. It brought one of my most favorite pictures to life, showing the pure joy on everyone’s faces. Even the coloring of everything in the picture was perfect, something that I thought was quite impressive for all the colors present, especially in Ivi and Reya’s fur. Honestly, I couldn’t believe everything was so cheap (only a fraction of the cost of anywhere else online I priced). Based on my own experience, if you want to get a canvas print of one of your favorite pictures, I highly recommend getting it at CanvasDiscount.com! Want to purchase a beautiful print like this one? You can find a large selection of canvas prints at amazing prizes at CanvasDiscount.com. 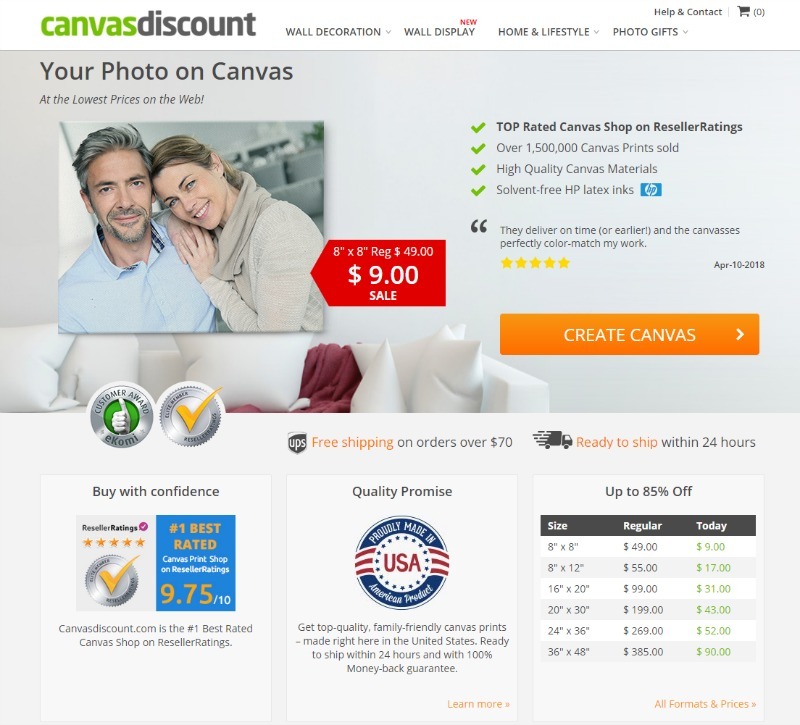 Also, we are very excited to share with you a cool promotion CanvasDiscount.com is doing just for our readers. 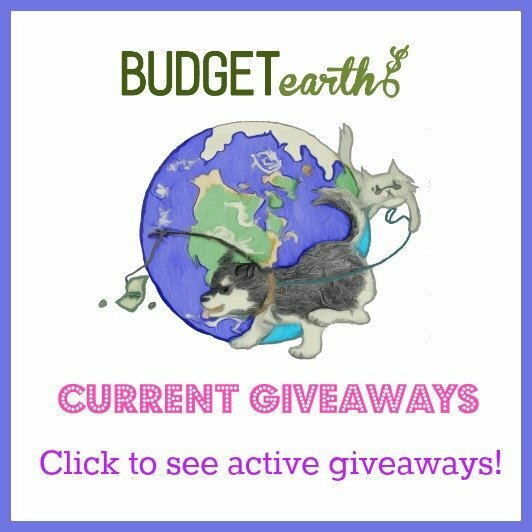 By using promo code – BUDGETEARTH – you can buy one 8”x8” canvas print and get another 8”x8” canvas print totally FREE! In other words, you get 2 – 8”x8” print for only $9! This promotion is only good until July 31,2018, so make sure to take advantage of it today at CanvasDiscount.com. Very vivid canvases, high quality that will be sure to last. I have used these for photos of my grandchildren and they really look fantastic. I would love to use a family photo that i have. It would be so special.